Dutch artist Guido van der Werve’s complex and multilayered film, Nummer veertien, home, weaves together three stories that involve journeys away from home and life in isolation: the death of Frédéric Chopin in Paris and his sister’s quest to bring the composer’s heart back to his native Poland for burial; Van der Werve’s own quest to retrace, in reverse, the route of Chopin’s heart in a thousand-mile trek of biking, running, and swimming; and the story of Alexander the Great, a traveling warrior who is one of the artist’s personal heroes. The 54-minute film explores themes that are common in Van der Werve’s work: extreme physical and mental endurance, man’s struggle with the intensity of nature, the power of melancholy, and the solitary traveler. The artist’s signature sensibility—simultaneously surreal and deadpan—is accentuated in the film by a full orchestra that accompanies him on every stage of his journey, beginning at the Church of the Holy Cross in Warsaw, where Chopin’s heart is interred, and ending three weeks later in France. The film laces together the accounts of Chopin’s heart and Van der Werve’s trek with the story of Alexander the Great, who, like Chopin, left home by the age of twenty and never returned. The film’s musical score, composed by the artist, is a classical requiem for forty voices and twenty strings, and the structure of the film mirrors that of the requiem: three movements of four acts apiece, with each act introduced by title shots to reinforce this organizational system. The tripartite framework, with its interplay of past and present, history and geography, underscores the three legs of Van der Werve’s personal triathlon—seven times the length of an Ironman—as well as the three odysseys that intersect and inform one another throughout the film. 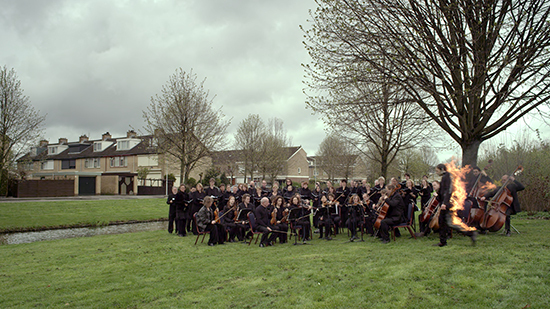 Van der Werve spent a year completing the score, and his requiem has been performed several times by a live orchestra, most recently at PS1, MoMA’s contemporary art center in Long Island City, New York, and at the National Centre for Contemporary Arts in Moscow. Lead support for this exhibition is provided by the Herbert W. and Susan L. Johe Endowment.